Ryan Allen Robert Kewaygoshkum-Miller of South Haven, Michigan passed away peacefully on April 6th at age 42, surrounded by many of his loved ones after a long battle with alcoholism. He was born in Traverse City, Michigan on May 7th 1975. Those left to cherish his memories include his parents Robert and Cathy Kewaygoshkum and Cynthia King-Baldwin, his three sisters Holli, Debbie, and Georgie, his brother Matt and Ryan’s partner, Billy Morgan. He is also survived by his former husband, Joe Miller, numerous aunts, uncles, nieces, nephews, cousins and friends. His friends were an important part of his large, loving family. Once you were in his life, you were family. 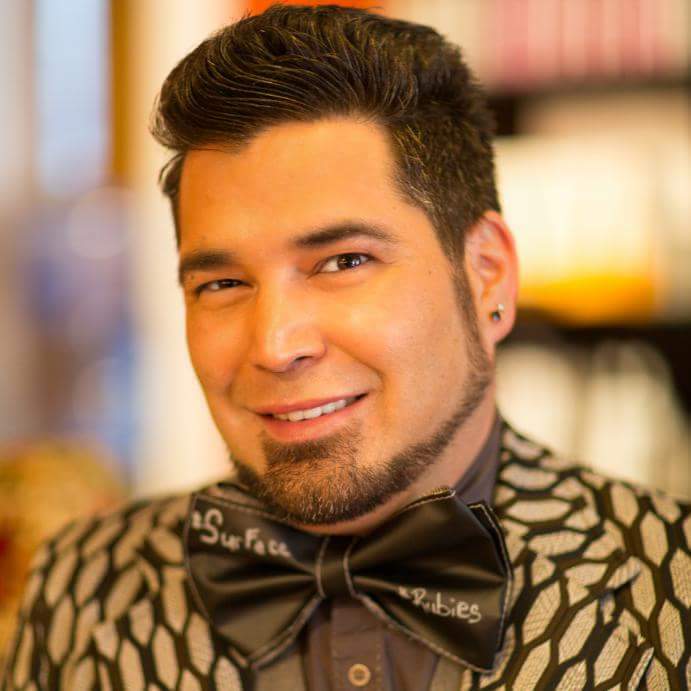 Ryan was a respected and exceedingly talented hair stylist and educator for Surface Hair Products. His enthusiasm, artistry and knowledge made a huge impact in the beauty industry and profoundly influenced everyone he worked with and mentored. He loved his dogs, Pax, Rex and Zim, and wholeheartedly supported local animal rescue groups often performing as Jada Knight many times. As a proud member of the Grand Traverse Band of Ottawa & Chippewa Indians, Ryan believed in a higher power and participated in ceremonial gatherings and dances. He found tranquility in the water, joy in music and dancing, and adored his home and community. He was the life of the party, a trusted friend and an amazing husband, son, brother and uncle. A true force of love, humor, and self acceptance, he taught those around him to live fully and unapologetically with confidence and self-respect. Ryan genuinely loved people and could make them feel significant and loved, with a warm smile, encouraging word or an embrace that could melt your heart. He enriched the lives of those who knew him well and made fast friends of new acquaintances... all were touched and inspired by his infectious laugh and genuine kindness. Ryan made a difference everywhere he went and we are all blessed to have known him. He will live on in our hearts and memories, we know he is laughing and dancing in heaven. A funeral service in honor of Ryan will be held on Saturday, April 14th at 4pm at the Filbrandt Family Funeral Home, 1076 S. Bailey Ave. South Haven, MI 49090. Following the service, we invite you to a Celebration of Life at the Elks South Haven Lodge, 405 Phoenix St. #1-2 South Haven, MI 49090. Contributions may be made in Ryan’s memory to the Anishnaabek Healing Circle, Access To Recovery Inter-Tribal Council of Michigan, 2956 Ashmun Street, Suite A, Sault Ste. Marie, MI 49783, Hospital Hospitality House, 527 W South St Kalamazoo, MI 49007, Attn: Judy Paget, and Grand Rapids Pride Center, 343 Atlas Ave. SE Grand Rapids, MI 49506.